I shoot a lot of pictures of the northern lights. Just like the next photographer, I thrill to the striking colors that glow from the back of my digital camera. When preparing those images for publication, many of us lighten or brighten the images so the colors and forms stand out better. Nothing wrong with that, except most times the aurora never looked that way to our eyes. The colors you see in aurora photos ARE real but exaggerated because the pictures are time exposures. Once the camera’s shutter opens, light accumulates on the electronic sensor, making faint and pale subjects bright and vivid. The camera can’t help it, and who would deny a photographer the chance to share the beauty? Most of us understand the magic of time exposures and factor in a mental fudge factor when looking at astronomical photos including those of the aurora. But photos can be misleading, especially so for beginners, who might anticipate “the second coming” when they step out to watch the northern lights only to feel disappointment at the real thing. Which is too bad, because the real aurora can make your jaw drop. That’s why I thought it would instructive to take a few aurora photos and tone them down to what the eye normally sees. Truth in advertising you know. I’ve also started to include disclaimers in my captions when the images show striking crimson rays. Veteran aurora watchers know that some of the most memorable auroral displays glow blood-red, but most of the ruddy hues recorded by the camera are simply invisible to the eye. Our eyes evolved their greatest sensitivity to green light, the slice of the rainbow spectrum in which the sun shines most intensely. We’re slightly less sensitive to yellow and only a 1/10 as sensitive to red. A typical aurora begins life as a pale white band low in the northern sky. If we’re lucky, the band intensifies, crosses the color threshold and glows pale green. Deeper and brighter greens are also common in active and bright auroras, but red is elusive because are eyes are far less sensitive to it than green. Often a curtain of green rays will be topped off by red, blue or purple emission recorded with sumptuous fidelity in the camera. What does the eye see? Smoky, colorless haze with hints of pink. Maybe. Again, this doesn’t mean we only see green and white. I’ve watched brilliant (pale) green rays stretch from horizon to zenith with their bottoms bathed in rosy-purple, a most wonderful sight. Another factor to keep in mind is dark adaption – the longer you’ve been out under a dark sky, the more sensitive your eyes will be to whatever color might be present. At night, however, we’re mostly color blind, relying on our low-light-sensitive rod cells to get around. Cone cells, fine-tuned for color vision, are activated only when light intensity reaches certain thresholds. That happens often when it comes to auroral green but less so with other colors to which our cells are less responsive. When an electron strikes an oxygen atom for instance, it bumps one of the oxygen’s electrons to a higher energy level. When that electron drops back down to its previous rest or ground state, it emits a photon of green light. 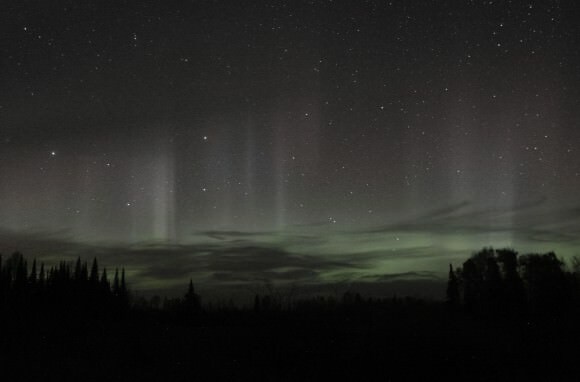 Billions of atoms and molecules, each cranking out tiny flashes of light, make an aurora. It takes about 3/4 second for that electron to drop and the atom to release a photon before it’s given another kick from a solar electron. Most auroras are rich with oxygen emission. Higher up, where the air’s so thin it’s identical to a hard vacuum, collisions between atoms happen only about every 7 seconds. With lots of time on their hands, oxygen electrons can transition down to their lowest energy level inside the atom, releasing a photon of red light instead of green. That’s why tall rays often show red tops especially in time exposure photos. Only during very active geomagnetic storms, when electrons penetrate to low levels in the atmosphere, are they able to excite molecules of nitrogen, giving rise to the familiar purple fringes at the bottoms of bright rays. Bombarded molecular nitrogen ions at high altitude release a deep blue-purple light. Rarely visible to the eye, I did record it one night in the camera. While videos hint at how wildly dynamic auroras can be, they’re no substitute for seeing one yourself. That’s why I never seem to get to bed when that first tempting glow appears over the northern horizon. Colorful or colorless, you’ll be astonished at how the aurora constantly re-invents itself in a multitude of forms from arcs to rays to flaming patches and writhing curlicues. Don’t miss the chance to see one. If there’s one thing that looks absolutely unearthly on this green Earth, it’s the aurora borealis. Click HERE for a guide on when and where to watch for them. Previous PostPrevious Where Did the Earth’s Water Come From?